Last Wednesday, on my personal book blog -- The Perpetual Page-Turner, I wrote a post containing wedding readings from literature and poetry. I'm planning my wedding and pretty much every Wednesday I write a"Wedding Wednesday" post about bookish weddings and my own journeys in wedding planning. Since my fiance is not in fact bookish in the least bit, I have to try and find little ways to incorporate my own reading obsession into the wedding in subtle ways. I found some romantic and swoonworthy passages for sure but as I was perusing through ModCloth's blog I found THIS and I think it would be perfect for using on our program or I could maybe smaller lines from literature in part of my decor in some way. BUT THIS ONE. This is my favorite. I love the art so much and that line. I just LOVE it. 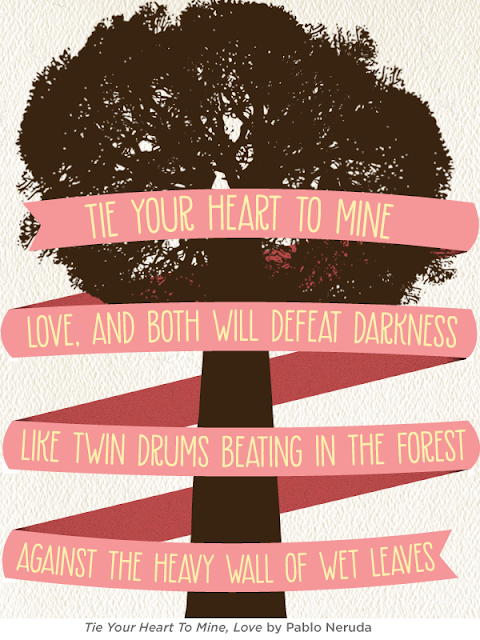 I had included some Neruda in my wedding readings post but this one is fabulous! Check out ModCloth's blog to see more from Jane Austen, Louisa May Alcott and more!! BEAUTIFUL. The words, the image, love it all. Right? I'm pretty sure my heart stopped beating for a moment when I saw it. It's PERFECT. that is so gorgeous, the words and all. I just got chills..
That's so wonderfully sweet and perfect! Love it oh so much! This is GORGEOUS. GORGEOUS and I LOVE IT SO MUCH. It's beautifully done! I had a bookish engagement (in a library), and I'm also hoping to use quotes in our wedding (which is next month). Great minds! There is a book tag that is going around that other bloggers get tagged and asked questions. I tagged you in my post. Go check it out and join in on the fun!